Roll-out playground stencils make application a breeze. No measuring! Just roll-out the full size playground stencils, chalk and then paint. 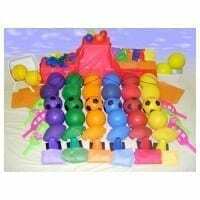 Brightly colored markings enhance motor skill development and provide activities for an outdoor motor learning lab or recess games. Hurry, these stencils will go fast and are a sale item only while quantities last. 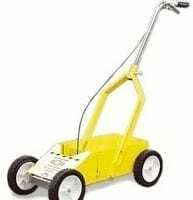 It's easy, quick and no need to measure. Stencil comes with layout instructions and game rules for Four Square. A real favorite of students grades 3-6. The hopscotch stencil is one piece of large paper for the court and one sheet of numbers. One of our popular roll out stencils. No need to measure. The Walking and Jogging Track is great for getting kids moving. The track is for elementary schools who rarely have the benefit of a designated running space. Full size roll out stencil.This geographically and proportionately accurate map of the United States is easy to apply and can be painted by 2 adults in five hours. 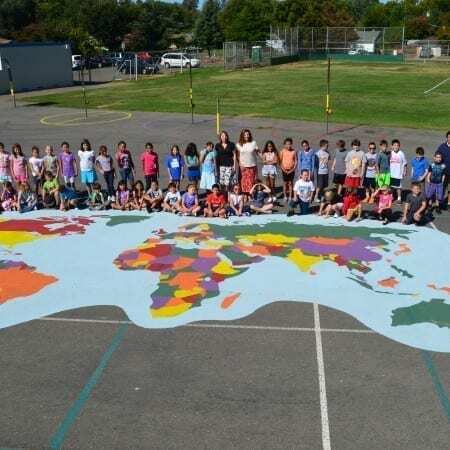 World Map Stencil with complete instructions & paint specifications. The eight section stencil has holes which define detailed borders of the continents, countries, oceans and largest lakes of the world. The regulation basketball court stencil provides for an accurate key forming a shooting range from both the 2 point line and the 3 point line. 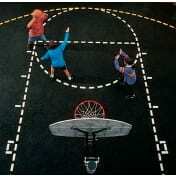 The basketball court stencil includes layout and painting instructions. It's that time of year. Time to replace the playground equipment to be ready for the fall. Now is the time to go over game markings and add new games for the fall. This is our most popular Web Seminar. Registration fills up fast and new dates are being added to accommodate more participants. Please register early! Completion Certificate upon passing course exam. This course details playground surfacing, play structure safety, and playground supervision. The course highlights legal supervision responsibilities and "how to keep kids safe". Purchase course $499 and get $299 value in Playground Supervisor Guides (1 for each teacher). Offer Expires August 1, 2014 Order now take class in Fall 2015. Copyright � 2015. 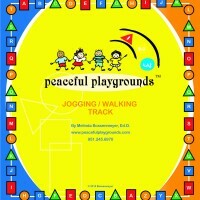 Peaceful Playgrounds Inc. All Rights Reserved.